Zooey Deschanel’s floral spring dress would bring out the fever in anyone. Zooey Deschanel adds extensions to create this thick mane of gorgeous hair. Zooey Deschanel pairs gold metallic pumps with this navy blue short dress. A pink short coat gives a pop of color to Zooey Deschanel’s black tights and boots. Zooey Deschanel adds a red wedge heel to her strappless sequined dress. Zooey Deschanel’s black blazer and jeans looks great when finished off with a pair of Mary Jane heels. A full bang and full cascading curls bring out Zooey Deschanel’s blue eyes. Oversized sunglasses and a trench coat channels Zooey Deschanel’s super sleath personality. False eyelashes, full thick bangs, and relaxed curls allow Zooey Deschanel’s beautiful features to come through. The lace overlay top compliments Zooey Deschanel’s bubble mini skirt. Zooey Deschanel’s side bun looks fantastic with her exaggerated collar. The big ruffles on Zooey Deschanel’s dress bring out her playful side. Zooey Deschanel’s soft romantic hairstyle showcases her style. The lace hem on this short dress emphasizes Zooey Deschanel’s femininity. This one-shouldered black and white dress with appliques shows Zooey Deschanel’s youthful personality. The beautiful brocade look of Zooey Deschanel’s dress lends elegance to her style. Black zig-zag trim add a playfulness to Zooey Deschanel’s white mini. Black leggings add contrast to Zooey Deschanel’s summer look. Zooey Deschanel’s full bang and unstructured updo pair nicely with her subdued makeup. Zooey Deschanel pairs opaque black tights with her soft red dress. This sheer sleeved, lace overlay dress shows Zooey Deschanel’s whimsical style. 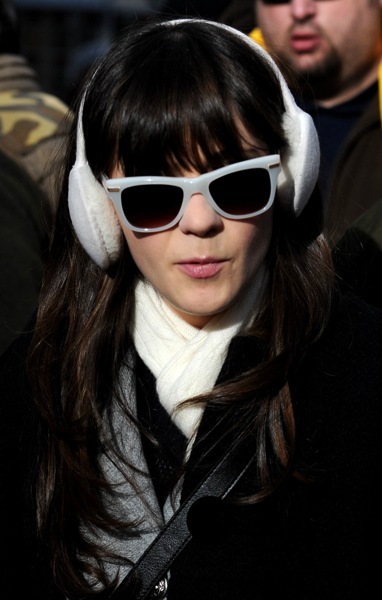 White sunglasses paired with white earmuffs shows Zooey Deschanel’s winter sunshine style. Zooey Deschanel compliments her LBD with a bright red lip. Zooey Deschanel’s loose braid matches the simple style of her LBD. Zooey Deschanel accessorizes her multi layered halter dress with a tambourine onstage. The embellished waist band of Zooey Deschanel’s grey dress adds delightful detail. The front bow and puffed skirt of Zooey Deschanel’s dress are complimented by black stilletos. The elegant soft waves of Zooey Deschanel’s hairstyle show how feminine she can be. The three-quarter length sleeve on Zooey Deschanel’s dress compliments the full skirt. The side ponytail and wavy tendrils give Zooey Deschanel a sophisticated look. Zooey Deschanel pairs a black mini skirt with black tights and booties. Zooey Deschanel’s navy blue halter dress is complimented by her casual ponytail. This navy blue dress showcases Zooey Deschanel’s playful style. Pink and black is a classic look for Zooey Deschanel. The blue sheer in Zooey Deschanel’s dress is paired expertly with black flats and tights. The subtle side barrett in Zooey Deschanel’s hairstyle is a very popular trend. This lilac summer dress has beautiful details that Zooey Deschanel wears gorgeously. An electric blue coat is accented with black earmuffs for Zooey Deschanel’s warm outfit. A jeweled headband completes Zooey Deschanel’s volume leaded hairstyle. Zooey Deschanel’s silver micro mini showcases her silver stockings. A short read peacoat tops off Zooey Deschanel’s winter style. Zooey Deschanel brings out the blue of her eyes with a pair of dramatic false eyelashes. Zooey Deschanel’s all black ensemble is complimented with a hot pink clutch. A side part and minimal makeup gives Zooey Deschanel a youthful glow. The New Girl actress stuns in this embellished black and emerald green gown. Zooey Deschanel takes a fashion risk with this plaid print backless dress. The New Girl star makes a unique choice with this lace dress with a giant bow detail. Zooey Deschanel on the red carpet in cutout collared blouse, navy skirt and pink lips. Zooey Deschanel is on trend with a low, teased pony and blunt bangs. The funny girl goes vintage with this bright red a-line dress. The New Girl star tries a whimsical look in this black and pink leaf print frock.